Over the past several years we have come to realize when it comes to tuna, there is a lot more than just canned tuna fish. There are a number of varieties of tuna—15 species to be exact—but you are most likely to come across just these four: bluefin, yellowfin (also referred to as ahi), skipjack, and albacore. The fish themselves range in size and color, with bluefin being the largest with dark red flesh, to skipjack, a lighter fleshed, smaller fish. Some varieties are best raw in sushi while others are ideal for canning. The varieties are very different from each other, so it is important you read your recipe carefully before substituting one kind of tuna for another. This is the variety with the lightest flesh and mildest flavor. It is usually canned as white tuna and sold at a higher price than light chunk tuna. The mercury level in albacore tuna is nearly three times as high as that of skipjack tuna, the Environmental Defense Fund reports, and therefore it is recommended that young children and pregnant and breastfeeding women watch their intake. This is generally the variety of choice for fresh tuna connoisseurs. It has a bit more fat—thus more flavor—than the other varieties. 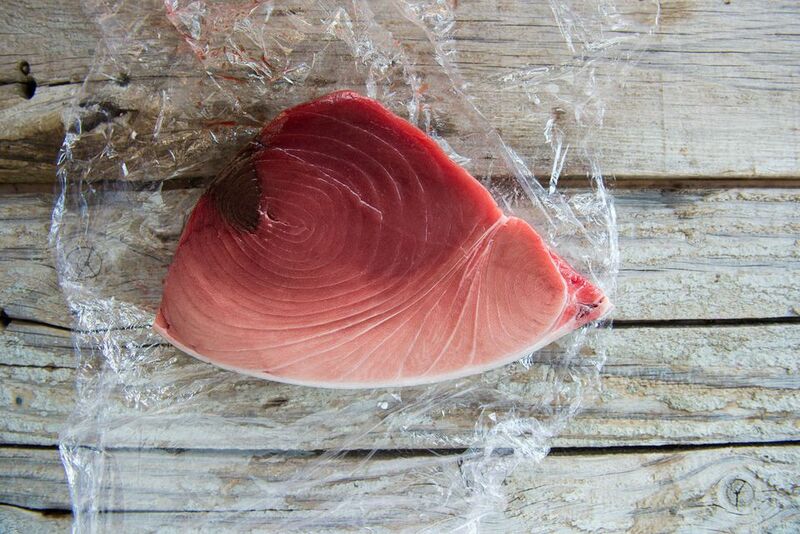 When the bluefin is mature, the flesh is dark red, with an appearance similar to raw beef. This variety is the largest, with the biggest fish recorded to have grown to about 1,600 pounds. Most of the bluefin harvest is exported to Japan and sold at a premium price for sashimi. As you can surmise from its name, this fish likes to jump and skip over the surface of the ocean. This variety is usually canned and is known as chunk light tuna. It generally has the strongest flavor and highest fat content and is also the smallest variety, seldom growing larger than 25 pounds. It is known as arctic bonito and aku—dried bonito is known as katsuobushi and is used in Japanese cuisine. Also known as ahi tuna, yellowfin is less expensive than bluefin, but is nearly as good. Yellowfin is also more common and easy to find in the grocery store or fish market. It is pale pink, with flavor a bit stronger than albacore. It is also often canned. Everybody knows about the tried-and-true tuna salad, tuna melts, and tuna casserole. But there are so many other ways to cook tuna, including salad Nicoise (a composed salad of tuna, olives, green beans, potatoes, and hard-boiled eggs with a delicious anchovy dressing), seared ahi tuna steaks, and spicy tuna sushi burgers. If using raw tuna steaks, it is important that you don't overcook—the fish tastes best when rare in the center (but of course, cook to your liking). If looking to make something out of the ordinary with canned tuna, consider deviled eggs with tuna, tuna risotto, or stuffed peppers with tuna.